These three similar compounds are commonly referred to as quinine's. Vitamin K is another of the vitamins that the body is able to produce and does so using the bacteria found in the large intestines. Vitamin K is often referred to as the 'blood clotting' vitamin because that is the task most commonly associated with it. However, it has many other important functions and those other capabilities are often overlooked when discussing the benefits of this vitamin. Blood clotting is needed to help wounds heal and Vitamin K is needed to help regulate and form the coagulator factors that clot the blood. Interestingly a newborn's stomach is a very sterile environment and for the first few days of life, it lacks the bacteria necessary to produce Vitamin K. Newborns are usually given a shot of Vitamin K as a way of kick-starting the blood clotting process. Vitamin K also plays a significant role in preventing heart and coronary disease. It accomplishes this by keeping calcium away from artery walls. Since calcium is not present, it cannot damage or block artery walls or the tissues that surround them. 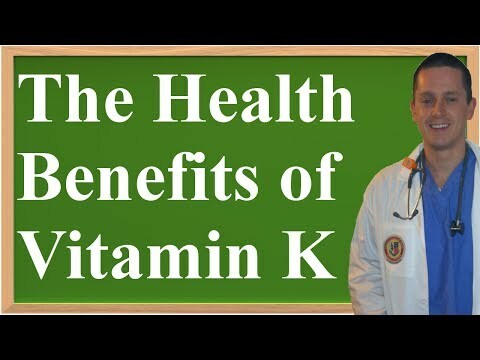 Using Vitamin K to help regulate calcium can also reduce the risk of developing kidney stones. Vitamin K helps build new, strong bones, too. Certain proteins are necessary in order to maintain healthy teeth and bones and those proteins cannot form without Vitamin K. The way Vitamin K enhances bone density is by acting in a glue-like manner so that calcium is better able to attach to bones. Women who experience heavy bleeding during their menstrual cycles are sometimes treated using Vitamin K. In postmenopausal women, Vitamin K can prevent the onset of osteoporosis by helping to increase bone mass. Leafy green vegetables are a great source of Vitamin K so be sure to eat spinach, kale, broccoli, collard greens, okra, asparagus, cabbage, brussel sprouts, green beans and turnip greens. It is also found in dairy products, corn and soya oil, liver, eggs, fish, seaweed, lentils, potatoes, nuts and alfalfa. The recommended daily intake of Vitamin K is as follows: For men, 80 micrograms/day. For women, 65 micrograms/day, even those women who are pregnant or who are breastfeeding. Deficiencies of this vitamin are more common among people who have digestive trouble, especially as it relates to the body's ability to properly absorb nutrients. Those who have had bowel surgery may also have insufficient levels of Vitamin K.
Since Vitamin K is so crucial to the blood clotting process, one of the most recognizable symptoms of a deficiency is the amount of time it takes blood to clot. Another indicator is a person who bleeds easily and for long periods of time. People with a Vitamin K deficiency also develop bruises more quickly than normal. Injuries that normally would be considered minor can become serious situations when blood does not clot as it should.